​After being in the land of ice and snow for a number of months, seeing the hills of California blanketed with bright green are a real feast for our eyes. We arrived at Varian Arabians on Easter Sunday. It was late in the day when I went out and found the horses. Roy was out in a big pasture munching away, but when he saw me, his ears perked up and he strolled right over with a lively step to say hi. After burying my face in his mane and breathing in that delicious aroma of horse, I left him and went to find Arizona Mac V. He gave me a very similar response. I'm sure he remembers me. He looked much more grown up than he had at Christmas. In the morning, I pulled my jeans on, zipped up my jacket and headed for the arena. Jaime had been riding Arizona up until about a week ago, so he'd had a good three months worth of education. Out in the sun in the arena, he circled around me a number of times in each direction at a walk and trot and a lope. "Whoa" I asked him to stop. I tried to make him stop straight, like Jaime taught me when we were here at Christmas time, and like Sheila had shown me a few years back. Arizona didn't have an over abundance of enthusiasm, so after a bit, I stopped him, grabbed a hank of mane and up I went. AHHHH... I closed my eyes and took a deep breath in, and out. It felt so good. We stood still for a moment and I petted his neck and asked him to go. He had learned a lot in the last three months with Jaime. He knew what was expected and he was delighted to comply. We walked, we trotted, we loped. We stopped, backed, side passed, pivoted on his hind end and front end, we walked and trotted over the bridge and the cavalettis. Right then he was the smartest, most beautiful, sweetest and most fun horse in the entire world. 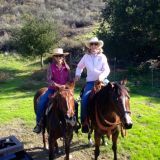 Two days later, at around 3:00, David and I decided that we did have enough time to go out to the Biddle Ranch for a quick ride. This is where Lester Buckley and Angela and I went just over two years ago to make that video with Major Mac. It is a spectacular ranch. Especially in the spring time. We got there at about four in the afternoon. It was warm. It was sunny. There was no wind. It was heaven. Arizona had never been ridden outside so this was a pretty big deal for him. He paused at the trailer door and took a deep breath, his big dark eyes scanning the horizon, seeing little black dots that were cows in the distance. I checked his cinch, turned him around right and left. He dropped his head and opened his mouth for the snaffle bit. As I swung up and settled into the saddle, I could feel his body, tight as a drum. His ears were straight up (those cute little ears) but his feet stayed perfectly still. David and Roy were right beside us, completely calm, being a good influence. I asked him to go ahead and he briskly walked on out. After about five or ten minutes he blew out a big butterfly exhale and his body relaxed a bit. We stayed on the trail, walking through some deep piles of fallen oak leaves, past little meadows of poppies, around huge rock outcrops. A few miles up we stopped to drink in the view and his ears told me to "look over there!". I saw a fat coyote lope across the hillside. 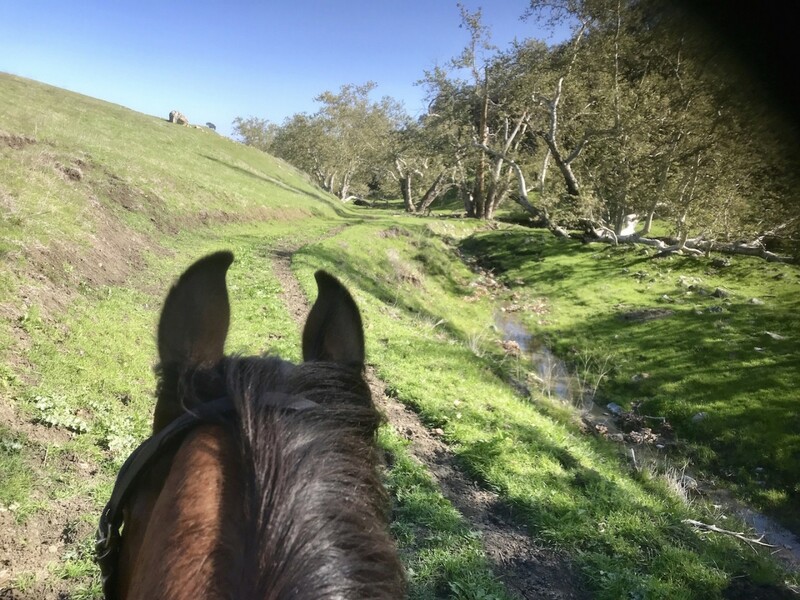 We never want to just go back the way we came, so we took a round about way back, climbing little steep banks and forging our way down and across some dried creek beds. At one point, David said "Follow me." Hearing this from David sometimes has given me pause, especially on a young colt. These words always delighted Sheila, because he's more of an "off the beaten path" sort of guy. He'll go anywhere, places most people wouldn't dream of. He does understand that a little bit goes a long way with a colt, so we didn't go far, but we followed Roy down a steep little trail to a mossy little creek crossing. Arizona stepped right down behind Roy, but at the water he stopped and said "oh Lisa, I'm not sure about this...." I let him look at it for a minute or two, just let him relax there at the water's edge. I nudged him with my heels (no spurs) and he took one tiny step. "good boy"... I petted him and we stood there for another minute or two while he relaxed. Then I asked him to step again. His body tightened up again but I could tell he was wanting to be brave. He put one foot in and then another, very carefully. He walked out the other side almost like a big boy. We roamed around a little more and crossed the creek again at another spot. I thought for a moment he was going to jump it like most youngsters do, but he tip-toed and then we were through it. "See," my own voice said inside my head. "he IS the smartest, most beautiful, sweetest and most fun horse in the world." We stepped over a few logs, big and small, navigated over hills and down through little rocky areas and just before we came to the trailer, there were a bunch of cows not very far off. He just looked. Body tight, At full alert, but not at all in a panic. A number of the cattle began to trot toward us, along the fence line, followed by a hiker that probably had no idea that he was making the cattle move. Arizona watched, but stood still. I got off, he lowered his head so I could slip the bit from his mouth. I loosened his cinch and he hopped right back into the trailer. It was just a little short ride, just over an hour. He did great. Sure, there were a couple of moments where he was a little overcome with joy and he made a few hops and tosses of his head, but it was just impossible to hold in how much fun we were having. I felt exactly the same way he did. The word is "Ebullient." Meaning: More than chipper, more than happy, more than delighted is ebullient — meaning bubbling over with joy and delight.